Laptops achieve a fairly comfortable balance between functionality and portability. From business to business or from office to home, laptops allow anyone to work just about anywhere. However, the best laptop lap desks and gaming lapboards extend this portability even further. No longer do people have to sit at a desk. They can now work on the couch or in bed. Laptop lap desks, for instance, are similar to breakfast-in-bed tables. Where a breakfast-in-bed table will accommodate dishes and breakfast, a laptop lap desk will hold a laptop. They are necessary when a person is sitting on a soft seat, such as a couch or mattress. Having one makes working on a laptop easy in what would otherwise be a wobbly, frustrating situation. Basically, they offer a wide work area on which the laptop sits, and the desk’s legs straddle the user’s thighs. If the model does not have legs, it will sit square on the user’s lap. Additionally, some even have a space for an external keyboard and mouse. 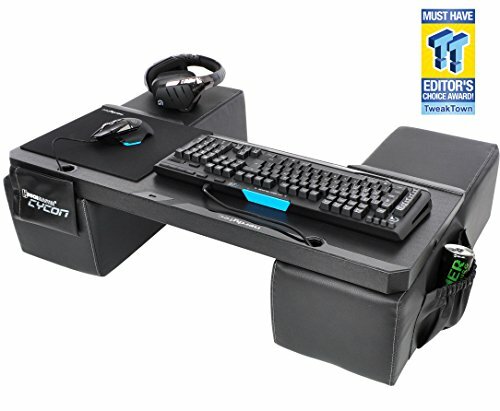 Gaming lapboards are a more compact versions of the lap desks. Unlike most lap desks, however, lapboards typically only offer space for the controllers, such as keyboard, controllers, and mouse. The goal behind the gaming lapboard is to allow traditional PC gamers more portability than is allowed at a typical desk. In terms of features, what a person needs determines what is best. These needs are typically driven by the size of the laptop or the number and type of connections needed to play a game. However, some basic features for any lap desk or lapboard are standard. Both the lap desk and lapboard should be of solid construction. If either expand, ensure the tracks are secure and solid. Check if the construction is of plastic, and if it is, ensure it does not bow. If it has legs, ensure the construction is solid and that the unit does not wobble. Surfaces should be grooved or lined with an anti-sliding surface. Anything that is too smooth will cause the laptop to slide. The desks should be heavy enough to withstand movement. For instance, a light, plastic lap desk or lap board could jar or topple if a person needs to adjust his or her posture or position. That said, the unit should not be too heavy. Since convenience is the key purpose of a lap desk or lap board, this is one feature that is user-defined. Most important are the cooling features. Laptops on laps cannot get enough air circulation to properly cool the electronics. Additionally, the heated laptop could be uncomfortable to the user. Consequently, a lap desk or lap board should come equipped with a fan and adequate vents. Additionally, the placement of the vents should align with the venting on the laptop. Usually, laptop vents are at the rear of the case, but sometimes they are on the bottom. Some lap desks and lapboards will be primarily for light-office usage. Light-office usage typically involves e-mail, word processing, or database editing. It might also involve some basic videography or graphic design. Heavy duty laptops will be for gaming or 3D design. Heavy duty and gaming laptops often have desktop-grade graphics cards as well as large screens. For these types of laptops, a sturdy, heavy-duty lap desk or lap board will be required. Since there are so many laptop lap desks and gaming lap boards, it is easy to get lost in all the options and features. Following are the best laptop lap desks and gaming lap boards. The Pilot LapDesk model is an executive lap desk. It comes in mahogany and bamboo, and its design is both sleek and minimalistic, perfect for any executive or solo entrepreneur. Without any legs, it is designed to be placed on top of one’s lap. Because it is made of wood, it has enough bulk and weight to keep it in place. It does not wobble, and it absolutely will not break. The natural bamboo wood helps distribute heat. Additionally, the center fan will help keep the laptop ventilated and cool. Without actual legs, the lap desk must sit directly on one’s lap or on a desk. For some people, having a desk sit directly on the lap could lead to tilting or toppling. Another executive lap desk, the LapGear Home Office version is available in espresso woodgrain, gray, and marble styles. It is designed to fit on one’s lap, and it offers two rounded cushions for comfort. The 22-inch wide surface will accommodate light-office or gaming laptops, and it has enough workspace for an external mouse. Additional features include a phone slot that will hold a phone vertically. Note: the smooth surface accommodates laptops with bottom cooling vents. Due to the smooth polished surface, placing a laptop on this lap desk would be no different than placing it a regular desk. Consequently, unless someone is using a gaming laptop or a production laptop with special cooling needs, this design should suffice. 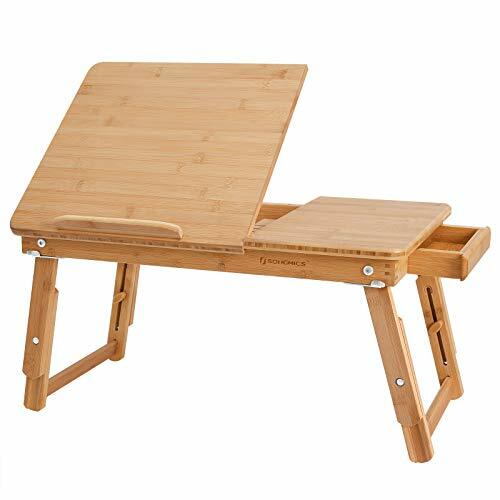 The Bookaholic lap desk is made of solid bamboo, and it has a variety of holes drilled for ventilation. An extra padded surface is suitable for an external mouse, and smartphone users can prop their phones into the phone slot for easy viewing or radio listening. It is suitable for notebooks and laptops up to 15.4-inches in width. The construction is certified organic, and no toxic materials are used in its construction. Note: unless the laptop is small, it will sit to the left side rather than directly in front of the user. 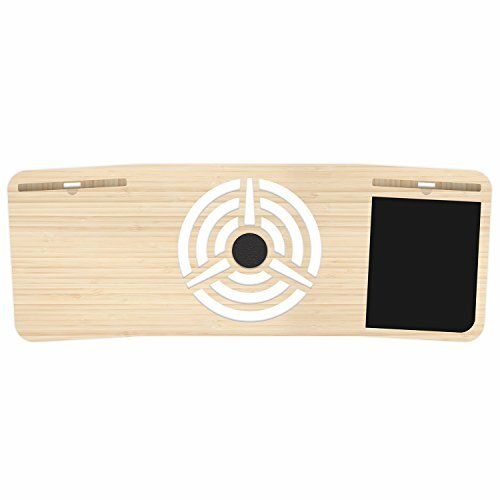 The SONGMICS Bamboo model offers multi-functionality to anyone with a laptop. 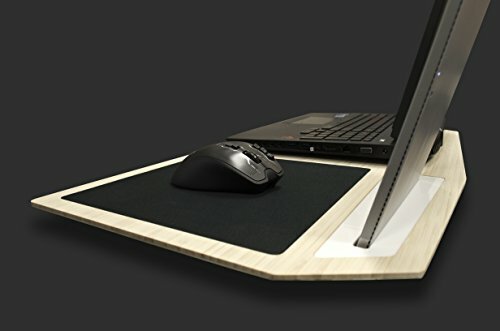 In addition to the standard keyboard and laptop support, its solid-wood construction offers sturdy secondary uses as a breakfast tray or reading desk. Small drawers provide storage for accessories such as a smart phone or pens. 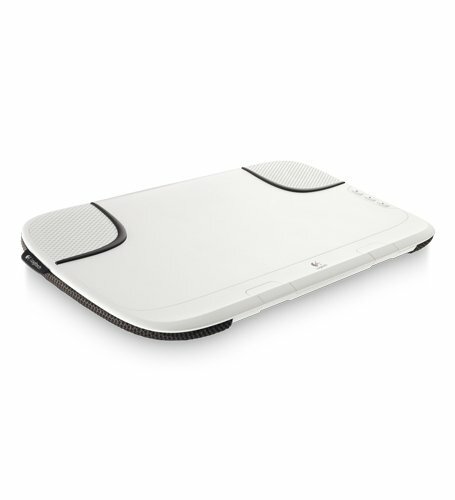 Additionally, the built-in mouse pad ensures smooth mouth performance at all times. 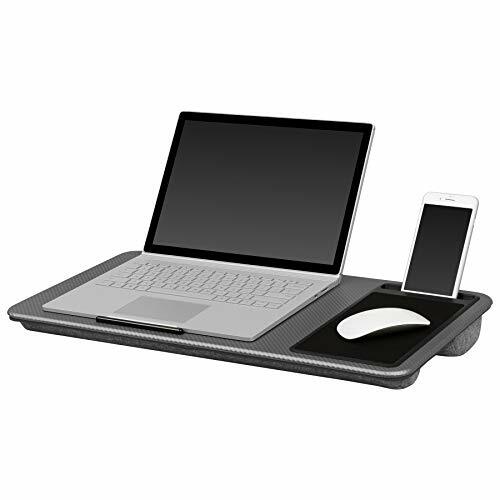 The lap desk will support a notebook or laptop up to 14.6 inches. With its sturdy construction, it is designed for people interested in light-office or entertainment capability. With such a compact design, it offers portability via any laptop case or backpack. 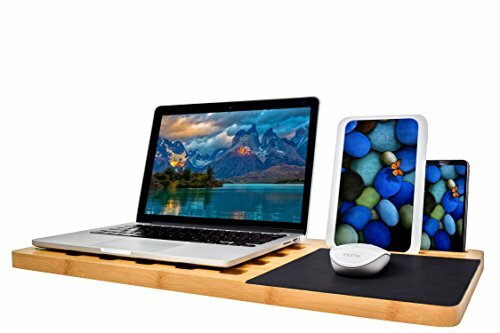 The lap desk by SONGMICS is solid wood, and it offers a multi-functional construction that allows for true desk-like stability on a bed, couch, or bench. It offers 21.7-inches of space, and because it props up on legs, it can be adjusted at somewhat of an angle to ensure a more centered laptop position. The lap desk includes a tilt feature, which presents the laptop’s keyboard “at” the user rather than in front of the user. Such a design allows for laptop usage in tight spaces, such as on a narrow couch. Also, whereas a person sitting on a couch is actually sitting in the couch (into the cushion, that is to say), with his or her arms angled upward, a person at a desk sits with the keyboard in front of the user, requiring arms to be outward. Consequently, for a person in a soft seat, such as a bed or couch, this angled keyboard approach is rather splendid and, perhaps, a bit more ergonomic. 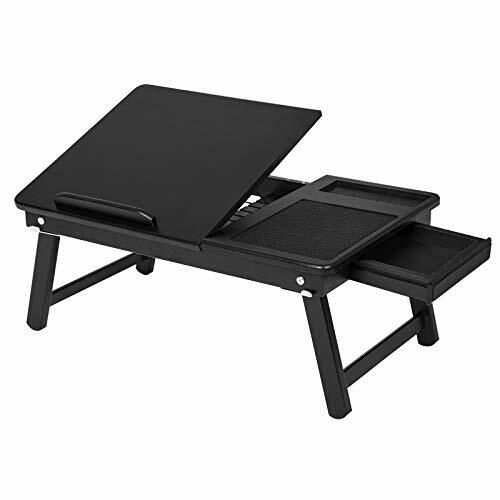 Frankly, the only bad thing about this laptop lap desk is that there is not a larger version for someone wanting to use a production laptop. For gamers, COUCHMASTER’s intent behind this spacious gaming lapboard is to altogether do away with the need for desks–and they might have succeeded. The four-port 3.0 USB connectivity allows for fast USB connections, and the wired 3.0 USB port offers no-lag playtime for people with wired connections. Memory foam arm supports provide cushioned rests for the player’s forearms, and side mesh pockets offer storage for snacks, phones, or accessories. Note: this gaming lapboard is for the player controllers. It is not for a laptop. It is primarily made for use on a couch or bed where the game monitor might be some distance away. Some sort of surface area for a laptop would make it more multi-functional, but it seems to perform very well as intended, which is as a lapboard. Admittedly, this is not much of a “con”. 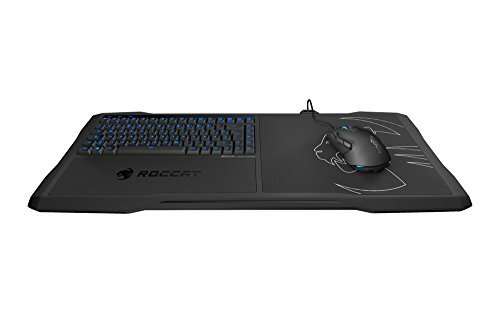 This gaming lapboard provides a contoured underside for stability. Backlit keys facilitate game play in a darkened room, and ample space is available for a keyboard and mouse. The keyboard membrane creates a silent typing experience, and the cushioned mouse pad provides ultra-precise aiming and scrolling movements. 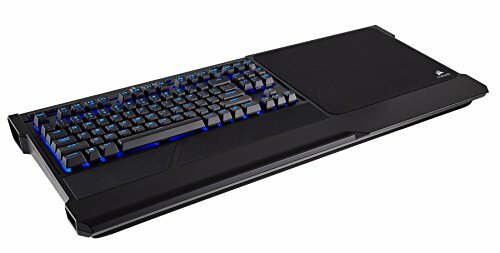 PC gaming on the couch is made easier with this contoured gaming lapboard. The mechanical switches offer infinite keystrokes. The popularity of mechanical switches arises from their ability to offer more resistance when typing, creating a better and more precise gaming feel. Illuminated back lights offer better visibility in dim rooms, and the compact design unfolds, allowing the lapboard to be tucked into a laptop case or backpack. USB connectivity includes two USB 2.0 ports. A 4-meter breakaway cable is also included. Cushions provide extra comfort for the lap and wrists, and all cushions are replaceable. Note: for gaming concerns, USB 2.0 provides nearly all the speed that a 3.0 USB provides. This means that although 3.0 USB connections are much faster than 2.0 connections, most games do not function in a way that makes 3.0 connections significantly more necessary than 2.0 connections. 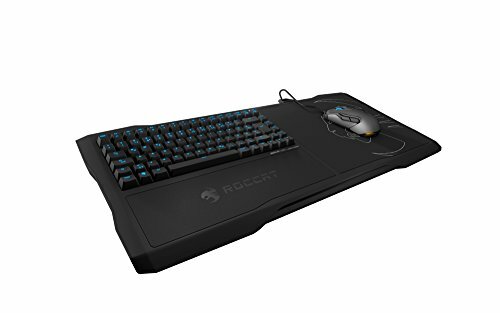 The Corsair K63 gaming lapboard model offers wireless keyboard connectivity for gamers interested in playing on a couch or in bed. The keyboard is full size, and the mouse area is spacious enough without feeling cramped. Connectivity options include wired USB and Bluetooth wireless. However, factory specs also include “ultra-fast 1ms 2.4GHz gaming-optimized wireless technology”. With these options, just about any player can find a connection method to reduce that universally dreaded lag. Memory foam provides comfort and stability for the thighs. Additionally, the overall weight of just over six pounds provides enough bulk to prevent the unit from feeling flimsy. Memory foam also provides extra lift for the wrists. Battery options provide up to 15 hours of wireless capability. 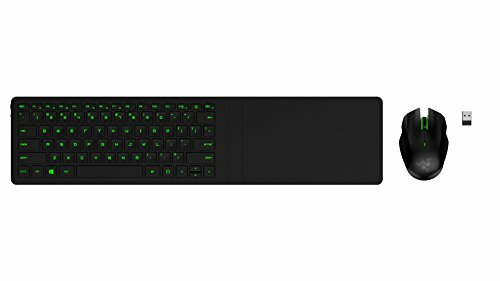 The Razer Turret gaming lapboard model offers slimline style wireless play capabilities. The button-style wireless USB ensures that the players sleeves or clothes will not become snagged. The compact mouse is good for smaller hands, and the fluorescent Kelly green keys are backlit for greater visibility. This model is designed specifically for easy portability, and the multiple charging options ensure any gamer has power when he or she requires. Interchangeable plugs ensure that the lapboard station can be charged even when available plugins might be non-standard. The unit has a folding hinge to hide the keyboard when it is not in use. slight build might be unsuitable for larger players. The Hover X+ is designed specifically for larger 17-inch gaming laptops. This unit’s large, sturdy design allows the keyboard to sit squarely in front of the user, which is where the keyboard should be. Although the mouse is to the right and, perhaps, off the knee, the lapboard is heavy enough to maintain stability. The inlaid accessory groove will accommodate a phone, and it is wide enough and deep enough for tablet use. A stylish grill provides ample airflow. At 25-inches wide, it is not as portable as some of the other options. However, that is the point. It is one of the only gaming lapboards large and stable enough for production laptops. The Logitech Speaker N550 model offers a compact style with a built-in speaker system. It is stylish and can fit notebooks or laptops up to 14.1-inches in width. The angled cushions provide stability. Additionally, the angled cushions complement the angle of the knees, providing a flat, comfortable vertical position for the keyboard and screen. Although the four-layer base helps dissipate heat, more venting space might help as well. In terms of air flow, ventilation is better than conduction.